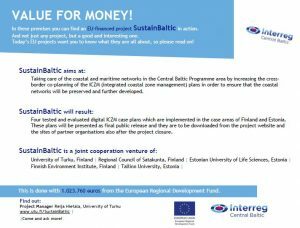 The outputs of SustainBaltic project i.e. 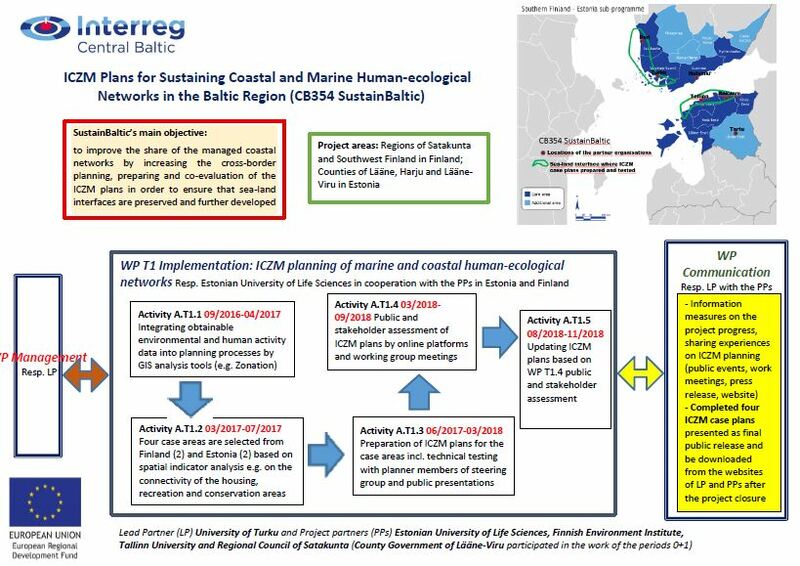 four ICZM (integrated coastal zone management) cases are ready for the implementation and further development in Estonia and Finland. Thank you for the participants of the final event, the steering group members and the project team! Together we are more! 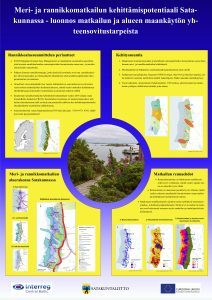 Draft of the ICZM case plan to combine the principles of ecosystem service approach and land use planning in the Kokemäenjoki watershed was published in July, 2018 at the webpage of the Regional Council of Satakunta (in Finnish). In this case, we present a general framework to describe ecological, cultural and economic interests of the case area and to integrate them in a comprehensive way into the planning via the ecosystem service approach (EcA). Watersheds are complex ecosystems that provide large variety of benefits to the nature and human well-being. The sustainable development of the watersheds cannot be enhanced without an integrated management of both the terrestrial and aquatic environments. The need for integrated management is emphasized in the coastal watersheds where the human pressures may be vulnerable to the marine environments and vice versa. Kokemäenjoki is the longest river in the southwestern Finland and it discharges to the Bothnian Sea. Kokemäenjoki river valley has been offering favorable conditions for human settlements and practising agriculture as well. Along this case study, we demonstrate the applicability of EcA in the context of the Kokemäenjoki river watershed and how this framework can be utilised to describe different values provided by different ecosystems. ICZM draft is presented and discussed with local stakeholders during the autumntime 2018. 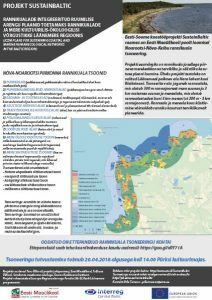 In addition to public presentation, interactive web-based survey https://app.maptionnaire.com/en/4424 is conducted to collect information about the preferences of the locals considering the pleasant places and meaningful activities along the Kokemäenjoki watershed. The final version of the plan is published by the mid-November 2018 after the feedback from the draft has been analysed. 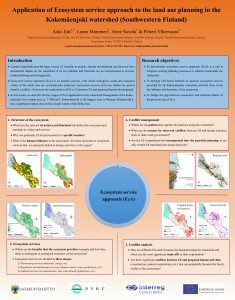 The poster about ‘Integration of ecosystem services to the land use planning’ was originally presented in April, 2018 in the conference of the European Geosciences Union held in Vienna, Austria. ICZM draft from the vision for sustainable tourism development in the Satakunta coastal region has been published on 19 April 2018 on the website of the Regional Council of Satakunta. Coastal and marine tourism is one of the major fields, in which significant growth is expected in Finland. Increase of tourism activities and recreational use of environmental areas can however have significant impacts to the environment unless the requirements of different environmental features and human interests are not jointly considered as a part of the coastal zone management. Clear wa ters of the Bothnian Sea and marine landscapes are the major assets for tourism development in Satakunta. To maintain the quality of the environment, it is however important to identify conflicts between different land use interests and to mitigate the impacts of various human activities (including tourism and recreation themselves) to the current state of the Bothnian Sea and its attractiveness as a tourism destination. In the prepared vision, we assess the current state of tourism in the coastal region of Satakunta and identify the features that are the most relevant for tourism and recreation. 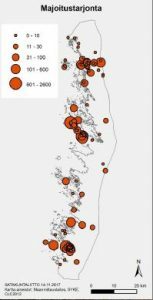 In addition, potential factors, how current and proposed human activities affect the general accessibility and land use along the shoreline, are identified. Using this analyses, total of 20 objectives are defined, with which sustainable tourism activities and attractiveness of the Satakunta coastline as tourism destination can be enhanced as a part of land use planning and environmental management. Draft vision is presented, discussed and evaluated with local stakeholders between May-September 2018. In addition to public presentation and different stakeholder group meetings, interactive web-based survey is conducted to collect addition data on the preferences of both local people and tourists considering the valuable sight and sceneries in the planning area. The final version of the plan will be published by the mid-November 2018, after the feedback from the draft has been analyzed. 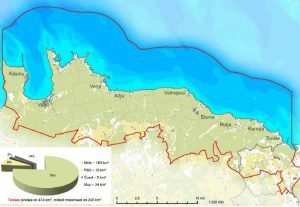 The ICZM plan draft for Läänemaa case area has been published on 9 March, 2018 in the website of Estonian University of Life Sciences. Läänemaa case area reaches from Hara peninsula to Ristinina peninsula. Area is located mainly in Lääne-Nigula municipality, but northwest part of Lääne-Harju municipality (Keibu village) is also involved. 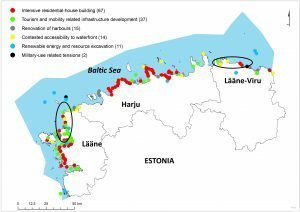 In the context of SustainBaltic project a zonation created for Läänemaa case area which covers the marine and coastal zones. Marine zones (= shallow waters i.e. 300 m from the shoreline to 3 km towards the sea) include 1) The general use and 2) The targeted management (see the methods of the Marine Spatial Planning). Coastal zones (=from the coastline 3 km towards the inland and 300 m towards the sea) include 1) Harbour and industrial; 2) Residential development; 3) Traditional residential; 4) Agricultural; 5) Tourism development; 6) Recreation; and 7) Nature areas. A web map application https://goo.gl/5dNC5F has been created to present the zonation and to collect the data from people. In this web map application people can make suggestions to change the borders or targets of zones and add valuable spatial data (e.g. information about closed roads, fishing areas etc). The information about zonation and public discussion about zonation has been published in local newspapers Lääne Elu (March 2018) and Lääne-Nigula municipality newspaper (April 2018), in Läänemaa County news portal Läänlane and in Noarootsi municipality’s Facebook site in addition to the posters that were placed to public areas in Läänemaa case area. The public discussion meeting about zonation and ICZM report will be held on the 20th of April, 2018 at 14-17 in Pürksi Cultural house. The stakeholders, local entrepreneurs and municipality officers and all local people are invited. The suggestions made by ICZM plan are indicative and local municipalities can utilise the ICZM plan in their planning processes. All the collected feedback will be reflected into the finalisation of the ICZM draft which will be published in the mid-November, 2018, near the end of SustainBaltic project. The ICZM draft plan of Lääne-Viru case was published on 27th March 2018 on the webpage of Estonian Life Science University. This ICZM plan draft is based on thematic analysis, field-work, international knowledge exchange, consultations with some interest groups and discussions with management group members of the Lääne-Viru case. The information about the ICZM draft and public participation meetings are also visible on the webpages of Haljala municipality and of Viru-Nigula municipality. 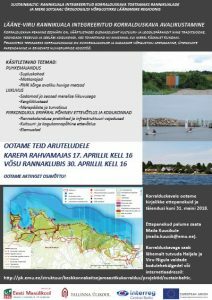 There are two public discussion meetings of the ICZM draft plan in Lääne-Viru coastal area: in Karepa community house on 17th April 2018 at 16.00 and in Võsu beach-club on 30th April 2018 at 16.00. The infor mation about these events is presented on several posters in public spaces of the coastal area, and circulated through the e-mail contacts. The local newspaper of Viru-Nigula Teataja published an article about the ICZM process and the public discussion event as well. Additionally, the project team currently prepares the web-based participatory GIS tool, which would generate flexible ways to give feedback to the ICZM draft plan. These two public events in Karepa and in Võsu would indicate if there is need to organise more meetings with interest groups. The presented public feedback would be carefully proceeded, discussed in the management group of the Lääne-Viru case and more integrated into the draft of ICZM plan in September 2018. The final ICZM plan of Lääne-Viru will be published after the reflections based on the public feedback in mid-November 2018. 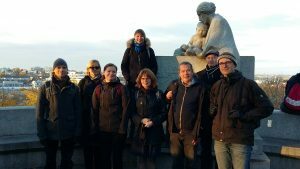 The progress of the preparation of EST and FIN ICZMs before the publishing of the very first drafts were presented and discussed in work meeting on 13-14 Feb, 2018 in Turku. Finnish ICZM cases locate in the Region of Satakunta being Enhancing sustainable tourism in Satakunta coastal zone and Ecosystem services of the Kokemäenjoki watershed and its marine counterpart. Estonian ICZM cases locate along the coasts of Lääne-Viru and Läänemaa. Their themes are relating to the multifunctionality of the coastal use between the recreation, tourism, other economic development e.g. agriculture or wind farming and housing. Fig. 1. ICZM case areas in Satakunta Region in Finland. 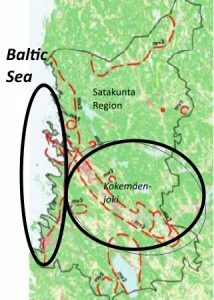 In Finland, the key theme for the ICZM case along the Satakunta Region coast is focusing on the role of tourism and another ICZM case covers ecosystem service based theme in the watershed of the River Kokemäenjoki in Satakunta Region (Fig. 1). ICZM can be used as a strategic tool to support land use planning and MSP. Regional land use plans and/or master plans define the current and proposed land use in Finnish project area. The scheme of planning process of ICZM is: assessment, current state, goal definition, future scenarios, strategic environmental assessment, conclusions and decision analysis (see the FIN ICZM case presentation 11 Oct, 2017). Fig. 2. ICZM cases in Lääne and Lääne-Viru counties in Estonia. In Estonia, the case areas for ICZM planning are locating in Lääne-Viru and Läänemaa (Fig. 2). The key themes of Lääne-Viru ICZM care are sea related mobility/transport, vitality of communities and renewable energy sources. In case of Lääne, the main key issues will be the access to the sea, harbor developments, swimming places, roads, protected areas and wind parks (see the presentations of Lääne-Viru and Läänemaa ICZM cases 11 Oct, 2017). 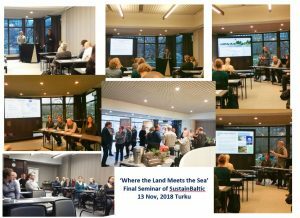 In the autumn 2017, Estonian and Finnish project team has carried out thematic discussions with the stakeholders and consultations among the local interest groups of the case areas. 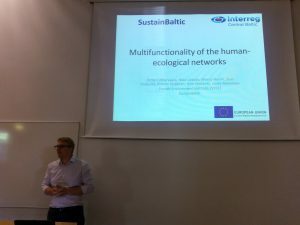 The first results dealing with the human and ecological data integration were presented at the public dissemination event 13 June, 2017 at Tallinn University. Here we are: Some representatives of the project team from University of Turku (as Lead Partner), Tallinn University, Regional Council of Satakunta, Estonian University of Life Sciences and Finnish Environment Institute. 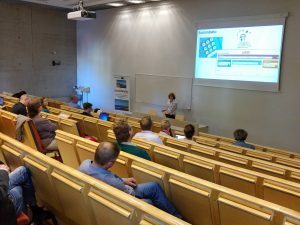 Our kick-off was held on October, 2016 in Turku.